The volume of newly provided housing loans by the Czech banking sector slowed significantly to CZK 23.8 billion in December. This represents the lowest volume of new loans since mid-2017 and CZK 10 billion lower than the previous months' average. Looking at new loans without refinancing, the volume declined to CZK 14.8 billion in December, the lowest figure since mid-2016. 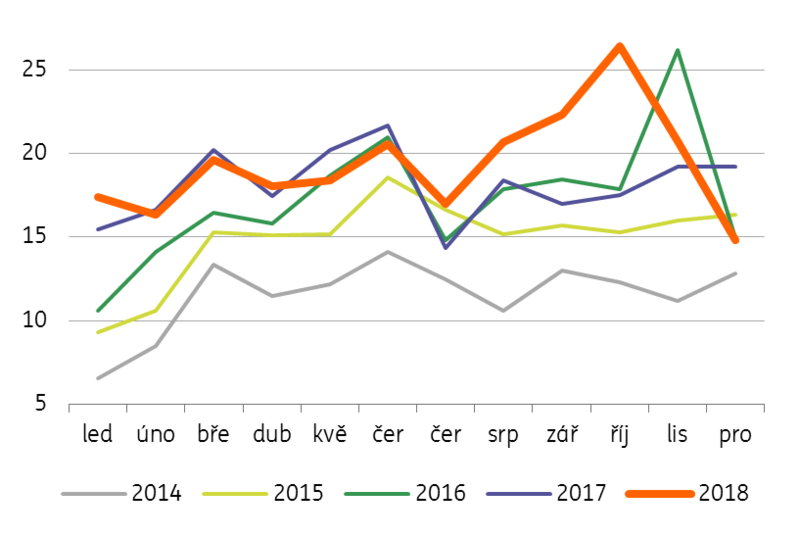 This development follows stricter CNB recommendations but most likely is driven by the substantial frontloading of mortgages during June-October last year, as many households were concerned that new recommendations by the Czech National Bank focusing on income limits would make mortgages unaffordable. Though these recommendations started in October, strong credit activity was visible in the November figures due to some delay in applying for and taking out a loan. Interest rates on mortgage loans rose slightly to 2.8% in December. Further increases in rates will largely depend on the development of longer-term market rates, however. These started to decline recently as a result of concerns about the global economy, with five-year market rates hitting the lowest level since mid-2018. This was related to market uncertainty about the slowdown in the global economy and the ability of central banks to continue with further rate increases. Given these developments, further rises in mortgage rates could be significantly slower than expected some time ago, and might even stop for a while. For the whole of 2018, the volume of real new mortgage loans (without refinancing) reached CZK 232 billion, of which CZK 167.5 billion was provided by banks, the remainder being provided by building societies. This represents a 7% year-on-year growth rate and an increase of CZK 15 billion. However, this growth was driven by the above-mentioned frontloading effect in 2H18, otherwise, it would be stagnating or even slightly falling in YoY terms, according to our calculations. It is broadly expected by the market that the volume of new housing loans will fall this year by around 10%, but this is just a preliminary estimate. As such, more time will be needed to really assess the impact of the CNB measures on the credit market and clean out the potential effect of frontloading, which will be affecting credit figures in coming months. Still, a 20% YoY December decline in new housing loans might be another argument for the “wait and see” approach during the monetary policy meeting next week, to provide CNB Board members more time to evaluate all the recent macroprudential and monetary tightening measures.